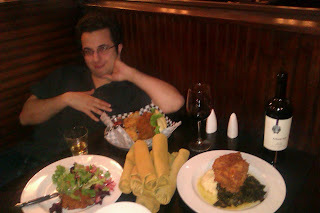 Leath with my chicken and his two entrees. The James Street Gastropub really knocked me off my feet. I can't even begin to say how impressed I was by the atmosphere and the quality of the food. I've been closely monitoring food trends in the fine city of Pittsburgh for years. I have to say that after a period of some stagnation we are on the up and up, restaurants are providing more interesting options, the competition for fine cuisine is more fierce than ever and gastropups seem to be all the rage. I'm still not positive that I know what a gastropub is, but the best description I've heard is, "an establishment with a sports-bar like atmosphere and fancy food." If this is how we are to define a gastropub, James Street hits the mark. The bar is very casual with a great basement lounge where they have live music several nights a week. The staff was attentive and friendly and the patrons seemed like they were all locals. And the food - the food was the best part. Personally, I like fresh oysters in the half shell. 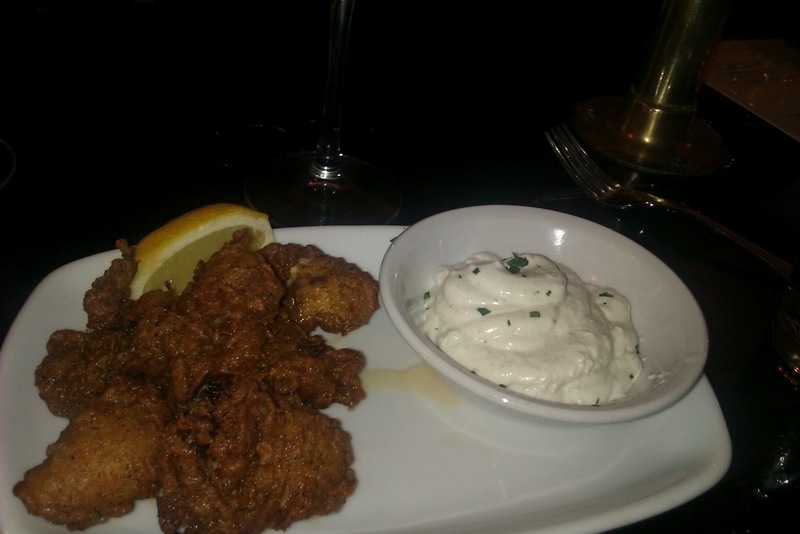 I think fried oysters are usually bland and oily, not to mention that they are generally frozen. The oysters from James Street were fresh and hand breaded. I suspected as much from tasting them, but I even asked the staff to confirm. My friend chicken, pictured above, was immaculately succulent. The greens were very well done and the grits were grits. I do not like grits. I don't think that any topping, preparation or gimmick will ever get me to like grits. I gave them to my friend Elias and he really enjoyed them, but honestly I don't think I can critically evaluate grits as they just taste like sand and rocks to me. We also tried the fried veggies. Lightly breaded peppers, onions, mushrooms served with a trio of amazing dipping sauces including a tomato relish I would have liked to take home. If you haven't noticed a trend by now you should note that the selections at James Street are largely styled after southern comfort food. What sets the James Street Gastropub apart from the competition is their offerings and their lack of pretension. Most of the sheik restaurants in Pittsburgh have a commonality to many of their specialties. At any given new restaurant opening in Pittsburgh I anticipate the following menu items: mac n cheese with some clever addition, fancy risotto, mussels of the day and skirt steak dressed handsomely with exotic ingredients. It is comforting to dine at a restaurant that takes care in the preparation of more modest offerings.